Do college degrees directly correlate to a person's eventual wealth level? Attaining wealth is a lengthy process for most investors. It is impossible to point to one decision or one achievement and say, “That’s why I am wealthy”. But investors do believe they have some explanation for how they reached their current wealth level, and there are trends related to the age and background of the investor which provides guidance to advisors working with investors from different generations. 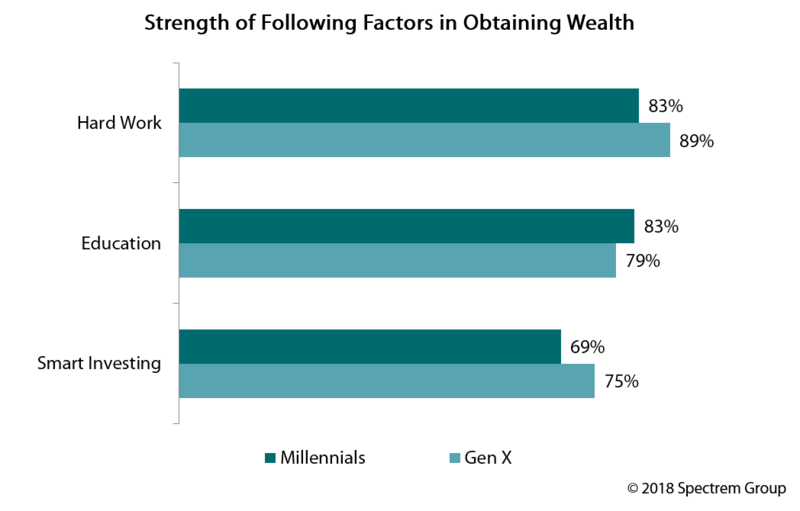 According to Spectrem’s age-related study Millennial and Gen X Investors: Attracting the Next Generations of Wealth, there are wealth creation factors that an overwhelming percentage of investors credit for their accumulation of assets. For example, 83 percent of Millennials and 79 percent of Gen X investors credit their education as a factor in their wealth creation. Ninety-six percent of Millennials graduated college, and 94 percent of Gen X investors got a college degree. It is noteworthy that 31 percent of Gen X investors went on to get an advanced degree, and 20 percent got their Master of Business degree. Millennials trailed Gen X in advanced degrees with only 25 percent and in MBAs with only 13 percent. The research point which makes Millennials look bad is that only 83 percent credit “hard work’’ as a wealth creation factor, while 89 percent of Gen X investors make the same claim. Another factor that hurts the credibility of Millennials is that 46 percent credit “luck’’ as a wealth creation factor, and only 39 percent of Gen Xers admit luck played a role. Seventy-five percent of Gen X investors and 69 percent of Millennials credit smart investing as a wealth creation factor. Thirty-two percent of Gen Xers and 31 percent of Millennials credit decision made by their financial advisor as an ingredient to their wealth level. The investors interviewed for the study had a net worth of at least $100,000 up to $25 million.